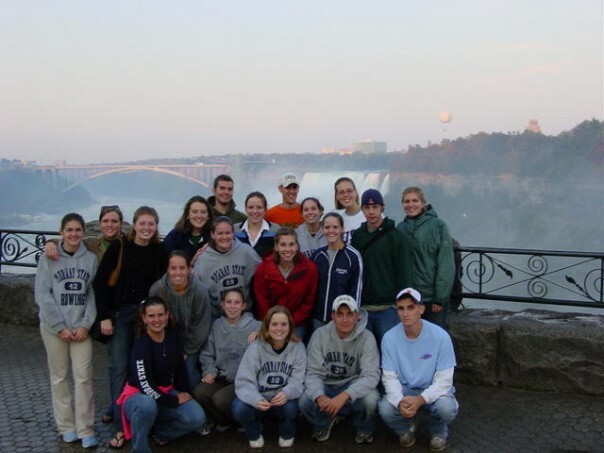 In Coach McLean's first year, he took the team to Rochester, NY for a race on the Genesee River. In addition, we made a quick trip over to Niagara Falls which was quite spectacular. But my most favorite moment of the trip was on the drive there. Coach was driving the mini-bus ahead of us boys (and Elaine) in a van, and quickly pulled off the interstate at an exit that had no life what-so-ever on it. Wondering what was wrong, we pulled behind the mini-bus to witness Coach running around in circles. Hoping to confirm our belief that Coach was a crazy yankee, we later learned that he was sleepy and just trying to wake up. If you have any good road trip stories, please share them with The Racer Rowing Society!